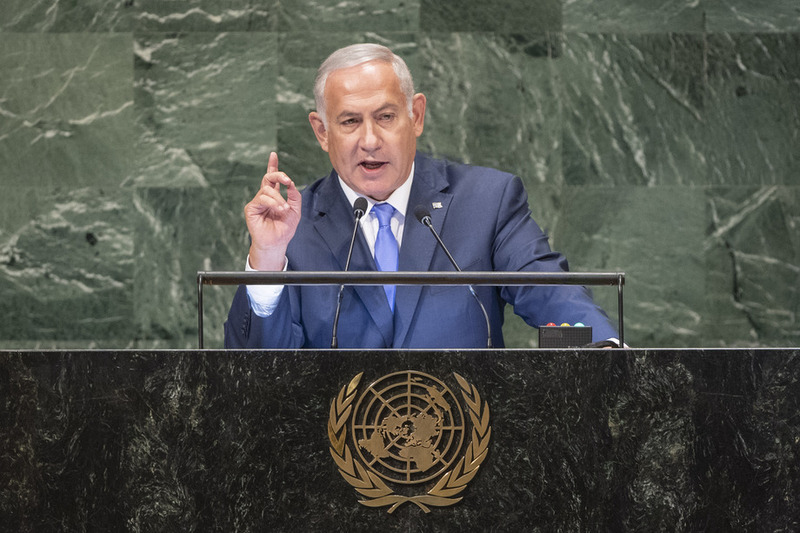 BENJAMIN NETANYAHU, Prime Minister of Israel, recalled that, three years ago, only his country, out of nearly 200 countries in the General Assembly Hall, opposed the nuclear deal with Iran. That deal was based on a fundamental lie that Iran was not seeking to develop nuclear weapons. However, in February, Israel conducted a raid on Iran’s secret atomic archive and obtained 100,000 documents and videos that had been stashed in vaults in a building in the heart of Tehran. In May, he presented a short summary of what it had obtained to the international media, including hard evidence of Iran’s plan to obtain nuclear weapons. That information was also shared with members of the Security Council's five permanent members and Germany, also known as the P5+1, and the International Atomic Energy Agency (IAEA), he said. Yet, IAEA has still not taken any action and has not posed a single question to Iran, nor has it demanded to inspect a single new site discovered in the secret archive. He then informed the Assembly that Iran also has a second secret facility in Tehran — an atomic warehouse for storing massive amounts of equipment and material from Iran’s secret nuclear weapons programme. Displaying a photo of the site, he described it as an innocent‑looking compound on Maher Alley, near a rug‑cleaning operation. When South Africa and Libya gave up their nuclear programmes, they destroyed the archives, material and equipment, he said. Iran did not destroy such materials because it has not abandoned its goal to develop nuclear weapons. There was a belief that Iran’s regime would become more moderate, more peaceful, and use the billions of dollars in sanction relief to improve the lives of its people. Instead, it used the money to fuel its vast war machine. Iran has attacked Kurds in Iraq, Sunnis in Syria, financed Hamas in Gaza and fired missiles into Saudi Arabia. Last month, two Iranian agents were arrested for plotting terror attacks in the United States and several weeks ago agents were arrested for plotting terror attacks in the heart of Europe. He went on to say that just as the nuclear‑deal supporters were wrong about what would happen when sanctions were removed, they were wrong about what would happen when sanctions were restored. They had argued that United States sanctions alone would have little impact on Iran. However, since President [Donald J.] Trump has forced businesses to choose between the United States and Iran, Iran’s unemployment and inflation rates have soared. Supporters were also wrong when they argued that restoring sanctions would rally the Iranian people around the regime. Although the people are definitely rallying, it is against the regime, with chants of “death to the dictator”, he said. He expressed Israel’s appreciation to President Trump and Ambassador Nikki Haley for their unwavering support for Israel at the United Nations, including Israel’s right to defend itself. The United States has also backed out of a history‑denying United Nations Educational, Scientific and Cultural Organization (UNESCO) and a morally bankrupt Human Rights Council. It stopped funding an unreformed United Nations Relief and Works Agency for Palestine Refugees in the Near East (UNRWA) that instead of solving the Palestinian refugee problem, perpetuates it. President Trump stood up to what has long been a speciality at the United Nations: slandering Israel. Recalling the United Nations resolution comparing Zionism to racism had been repealed long ago, he said that opinion still lingers at the Organization. Israel is accused of racism, yet its Arab citizens have the same individual rights as all other Israeli citizens. Israel is also accused of apartheid. “This is the same old anti-Semitism with a brand-new face,” he underscored. President Abbas said that Israel’s new nation-State law proves that Israel is a racist apartheid State, he continued. Yet, Mr. Abbas’s dissertation denied the Holocaust and Palestinian authorities impose death sentences on Palestinians who sell land to Jews. Stating that President Abbas proudly pays Palestinian terrorists who murder Jews, he stressed that such actions are not the way to a peace that is wanted and needed and to which Israel remains committed. In the Middle East, where women are often treated as property, minorities are persecuted, and gays are hanged, Israel stands out as a shining example of freedom and progress. Commending Israel’s teachers, doctors, and search and rescue teams who save lives from Haiti to Mexico, from Nepal to the Philippines, he said he is most proud of his country’s people who are determined to build a secure future for the one and only Jewish State.